Stargazing: When is a Constellation Not a Constellation? Every culture in the world has its own myths and legends and had different ways of joining up the stars into patterns. The ancient Greek constellation names were passed on only by historical accident, and it’s these names that are the formally recognised astronomical constellations. Chinese astronomy has 31 constellations (called enclosures), while the Native Americans also drew patterns in the stars, as did Australian Aborigines, the ancient Egyptians and cultures the world over. In 1922, the International Astronomical Union (IAU) formally defined 88 constellations and their boundaries, and stargazers around the world use these constellations. 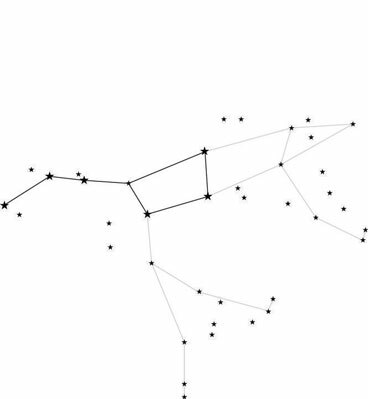 Having a defined set of constellations helps prevent possible confusion when astronomers in one part of the world refer to a constellation as looking like a queen while others see that group of stars looking like a camel! Stargazers call these nonconstellation patterns asterisms, and they shouldn’t be confused with the official constellation patterns. The Big Dipper is one of the most famous asterisms in the sky – so famous, in fact, that most people think it’s a constellation in its own right. Actually, the Big Dipper is only part of a bigger constellation, Ursa Major, the Great Bear, shown in the figure. The table lists some of the more famous asterisms and the constellations that you can find them in.